Create a pivot table that is based on a dynamic data source -- that is a range that adjusts automatically, if data is added or removed. The first step in creating a Pivot Table is to organize your data in a list of rows and columns. Make sure that there is a heading in every column, and no rows that are completely blank. the data is in rows 4 to 9, from column A to column H.
Next, set up the data range as a dynamic range, using one of the 3 options shown below. A dynamic range will automatically expand or contract, if data is added or removed. You can base a pivot table on the dynamic range. Then, when you refresh the pivot table, it will include all of the data in the range, even if new rows have been added. 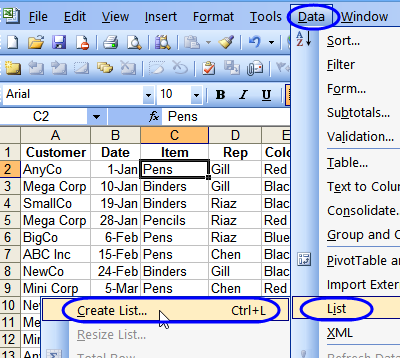 In Excel 2007 and later versions, you can format your list as a Named Table, and use that as the dynamic source for your Pivot Table. 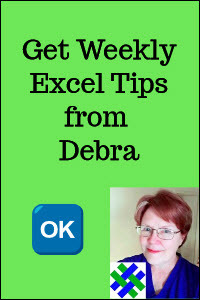 There are detailed instructions here: Excel Tables -- Creating an Excel Table. 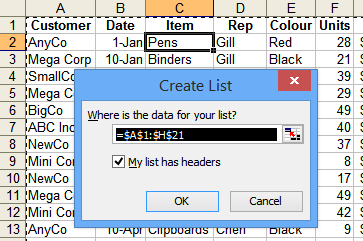 In Excel 2003, use the List feature to create a dynamic list. It is a built-in tool that will create a List object on the worksheet. Add a check mark to the "My List has Headers" option. 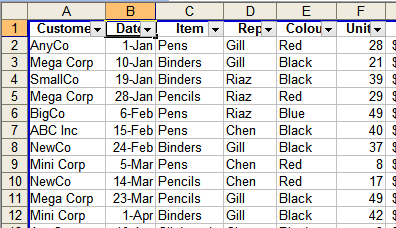 When a cell in the List is selected, the list has a solid blue border around it, and there are filter drop down arrows in the heading row. There is also a blank row at the end, where you can add new items. If you prefer not to use a named table or list, you can use a formula to create a dynamic range. This formula can use the INDEX or OFFSET functions to create the range. This video shows the steps for using the OFFSET function, in Excel 2007. Once you have the dynamic range set up, you can create a pivot table, based on that range. Excel 2013 -- Follow the instructions here. You can download the zipped sample file used for this tutorial.